Discover why grouping your images together to tell a story is so powerful. Share - A free course for you to check out. Inspire - The power of grouping images to tell a story. Create - Lightroom tip for speeding through your post processing. Johny: Hey guys what’s up? Its Johny here and welcome to another episode of the SIC show. I just realized I haven’t flapped my hands. That’s good. Man what have we got on this week on the show bro? Brent: Well, Johny’s going to actually share his free new course that’s coming out. Johny: I’m super pumped about it man. What else are we doing? Brent: Yeah and you’re going to tell a story of your trip to Tokyo in Japan. He’s telling a story of his black and white images. And then Johny’s also going to show us how to save time in Lightrooom by syncing your images. Johny: Let’s get into it man. I am super pumped. Brent: Alright Johny, share something with us. Johny: Yeah, well man I’m super pumped. I’ve been working so hard getting this ready. We got a free post processing course. I’m going to put out buddy. Johny: Yeah, and post processing is such a big beats and really there are a lot to learn. But when you break it down, there are only few big things or big problems that people have you know. And I’ve found those problems and I’m going to give you the answers. And that’s basically what the whole course is about particularly when you’re first starting out. It’s all about you know those there’s a couple of big mistakes we’ve all made. A couple of examples man like over cooking, we’ve all overcooked our images. It’s so easy to do. But I’m going to give some excellent tips on how to avoid it and it’s not just “don’t touch the saturation”. Brent: Saturation all the way to the right. Johny: Hyper colored fairy land. Awesome man, a few shows ago you missed it. You would see how a hyper colored images. Looking back at my old work it’s so funny man. Brent: So what’s it called this free course of yours? Johny: It’s called Johny’s Free Post Processing Goodness, no it really haven’t got a name. There’s no name. It’s just like about avoiding the major mistakes that people make in post processing and giving you the skills to basically not make those mistakes yourself. Johny: Man I wish that someone had told me this stuff when I was starting out. Brent: Yeah me too man. Brent: 2 months, 2 and half months actually Johny has been working on this course guys. And it’s free. I can’t believe it man. You should be charging for it. Johny: Yeah I know bro but you know as usual man I want to share the photo love and give back so yeah guys check it out. I love to get your feedback and yeah check out the link man coz it’s going to be awesome. Brent: Alright buddy, inspire us with some of these amazing images you got from Japan. Johny: I will but before I get started, a little screencast that I’ll probably going to cut to coz there’s a heap of images are here I want to go through might really quickly. Johny: I want to share some images about telling a story and like I’ll be honest, some of these images they aren’t that shuttering, they aren’t amazing like “Oh my God” you know. It’s not like “Oh my God look at that image.” But you put them all together, they tell a story. And I’m thinking about it now, I haven’t looked at these images for probably 12 months. And flicking back through them, I’m getting that feeling of when I was there. So these images are from Tokyo City in Japan. And also had a really long train ride where the train’s tucked in the snow. Johny: Yeah, so it‘s funny. Actually it’s one of these images. I’ll tell a little story of one of these images but basically it’s about getting a group of images together and creating some sort of a story. And you’ll notice they are transformed in all black and white. I love the simplification. That black and white keeps to an image taken away. And they are all cool coz it surrounds snow. And you’ll see the slightly cool. Brent: So did you put that tone on them? Johny: Yeah, so there’s a slightly cool tone to them. Not it’s very subtle. Y0u may not notice it but man black and white is all about subtlety to me. Little subtle things you know. So anyway, let’s jump by the screencast and get started. I’m just going to flick these rather quick guys okay. So the first couple of images that I made are actually there to go snowboarding. And also snowmaking. It’s absolutely epic so I’m just going to filmstrip so I know where I’m about in here. Brent: By the way, the snow making is on my bucket list. I need to get there. Johny: And to tell you, it’s a place that so many people photographed but man don’t just count that you know. If you’ve got a place on your bucket list has been photographed a million times by million other photographers, go and do it because there’s nothing like doing it yourself. Honestly that half an hour I didn’t have much time. We got there late in the day with the tour trip taking again. I had about half an hour once I walked in the 40 minutes or what it was. And man I tell you what, about the half an hour I‘ll never forget man. It was just awesome. You know being that close to the wild animals will chilled out and relaxed. It was absolutely epic so don’t just count it man. Brent: Yeah and you can always get a different angle to whatever else got at these locations that has been photographed a million times. Brent: Alright, let’s jump on it Johny. Johny: So the first couple of images are just with the guys there. And it’s just candid moments man. Hey I want to tell you guys another thing. This was shot in III D7000. Johny: And the lens was 24 to 200 I think it is. Johny: It’s just like a kits lens, yeah basically. Well, it wasn’t a kit lens. This one I brought lighter on. But it’s like a 3.5 to 5.6 so nothing special. It’s just great lens. It covers a lot of focal length. So that’s it man. Let’s go through it. Brent: So you don’t need the best equipment when you’re traveling? Johny: You don’t. Definitely not so you can see these are just candid images of the guys. We were just sitting around. I took all these at the same time. Johny: So they are all just sitting around in the shop. These are the four guys I was with. And you can see this out in the street. Brent: And that’s in Tokyo. 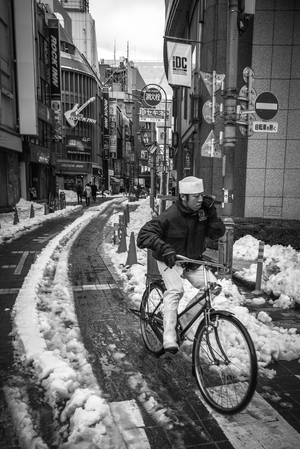 Johny: This is in Tokyo, yeah, there was amazing amount of snow. It was the most snow they’ve seen in so long. And that’s why the train got held up as well. Johny: You can see you know as you start go through these and build these. This is all one walk out the street I took all these, okay. Johny: So for one walk out in the street I just had my camera and they’re going to take a little bit to load there sorry guys. That one is not blurry but it’s just my old laptop. And you are just picking out little details like this cool little I have no idea. Johny: Yeah that is a taxi. Brent: And I can read that. It says taxi. Johny: Does it? Okay. I think it says person jumping over a sheep in a fence. That’s what I read it out. So this is another photo of the guy. Brent: And that’s graffiti in Japanese right? Johny: Yeah it is. Actually I got some close up graffiti. So anyway, I’ll just quickly flick through these. You know this is where we had lunch. Brent: Hey I love that curve building. Johny: Yeah it’s cool huh, wicked. Look at the façade. It’s really wicked. Brent: I do like the black and white because to see the curve building, I don’t know if there’s much color in those buildings. But it would’ve taken away. Johny: Well, it’s sort of a gray day remembered. It was actually a bit of a gray day. But you can see the different lights. So basically guys all these photos haven’t had a lot of work done to them okay. So just fixed up the basic exposure and converted them all black and white. And I’m going to show you in the create section how to quickly do that across multiple images in Lightroom. But as you can see, just kind of quickly flick through these; just candid little moments you know. These 2 girls on the street just pulled up and I said “hi, let’s roll in the camera” and they nodded their head. I can’t speak a word of Japanese. But that timing is of the first day we’re in. We stayed in Tokyo one night. I just walked around Tokyo and all these candid moments you know. A lot of people and this lady, the guy pulled his masked down, it’s just little moments you know. Johny: A bit of a pattern. You know patterns are a wonderful thing. You know just looking up the sky, a tree in between the frame by 3 buildings. Nothing shuttering but when you’re putting them together it’s just lovely. And you know it’s just exciting to go out and find these things. It doesn’t have to be a big city you know. Brent: It could be a backyard. Johny: It could be yeah. Brent: And you know I love that Johny. Just being in one place and just actually looking around and looking up, and looking down. You know often everyone’s just looking ahead at where they’re going instead of just stopping and looking around. Johny: It’s really a good point buddy coz you know often when we are in big cities; we tend to be rushing to where we’re going. But you pick up the camera and all of a sudden everything is going “zzhhhhh” it’s like 5 times slower. Johny: And you’re looking around and you’re feeling the location. Brent: In the moment really. You’re totally in the moment. Actually time does stand still. Brent: it feels like it’s standing still. You know 5 minutes later it’s 2 hours have gone by. Johny: Yeah, I know. Yeah that’s it. So I’m just going to quickly flick with these. So I’m still in Tokyo here. So that’s a close up picture of graffiti. So guys one these aren’t technically hard images. It’s overcast, and the light’s not so flat and it’s bright. I don’t have to do anything tricky with my camera. You know it’s just patterns. These are awesome. You know this guy he was actually telling me to get out of there, you know, I took his photo. He’s like “Oh go” or something like that. He wasn’t happy with me but you can see it’s just that interesting little moment and the glass is cutting him off you know, sort of just under his eyes. You know funny signs, like I said this is interesting too you know. 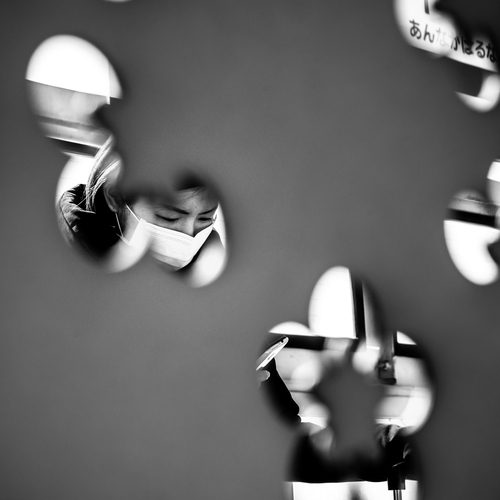 Focusing on something and getting shallow depth the fields. So focus on the sign there. But the background obviously you can see it’s in the city, there are people there but it’s out of focus. So it tells a bit more to the story or what’s going on. So anyway, I’ll just quickly flick through these. You know that was an overhead bridge, just couple of lines across the screen. There are footprints in the snow. Johny: Yeah so interesting corner on the street. You know all these were taken these ones here in Tokyo, about 2 hours walking around the city. Johny: So it wasn’t like I was there for weeks and weeks and weeks. Brent: Cool man and those leading lines. Johny: Yeah so you can see the leading lines in the snow there. Now this one I was crossing the street. I just got really low and you can see there’s a line. And the people and their reflections; I just thought yeah cool little spot. Anyway, but you got to be able to feel for it. Brent: I just love that man. The story that Johny’s telling with the images, they do. They tell amazing stories of your time in Tokyo. Brent: You’re looking around capturing those little moments. And I bet the other guys when your team or your tour they were going snowboarding. They’ve done a couple of snapshots. They probably didn’t even see half of what Johny’s actually photographed. I think if you show them this they’re going to like “what?” That’s like an Alien. Johny: Yeah I know. It’s a bit of graffiti. Hey I want to show you this one. This was really interesting. So we pulled up in a platform, one platform and we’re only there for a few seconds. I actually jumped off the train coz I saw this thing. I jumped off the train. Brent: Have you had your passport with you? Johny: Man I was just lucky. I jumped off the rain. There hadn’t a few passengers getting on. I saw this awesome pattern man. And I took this photo through this thing here. And I just went “man that is cool” you know. It’s like a steel sort of divider. It’s got this flower patterns. But I actually snapped a couple of photos. So there were reflections on the ground as well. Oh I just thought you know how these cool little things often if you haven’t gotten your camera you’re going to miss man. Hey this one is really interesting. This is just a snap shot again. I just had my camera set up. I just jumped off the train. Actually I had to run this time. So I run at the back of the platforms. I saw this awesome mountain. It just happen to be the place I pulled up this awesome lamp is sort if set up in the back mountain there. I just took a quick snapshot. I took one photo man and jumped back the train or else I would’ve missed that. But yeah it’s just cool. Brent: And I wouldn’t recommend doing that, guys on a train in a foreign country. Johny: Yeah don’t jump off. Brent: If you’re buddied on the train, if your passport and all your stuff’s in the train and you jump off to take a picture. And I know those trains in Japan. They don’t wait for anyone. They will just go and you’ll be left behind on the platform with nothing. Oh not good. Johny: I got to say we were stopping for a few minutes. I had a couple of minutes because the train was being slowed down by the snow. They’re clearing the track in front of us basically because of the snow. So I do have a little bit of time. But anyway guys, I just wanted to say you know don’t just count having your camera ready when you’re somewhere, when you’re out to places and taking a number of photos and put them together because often you know one photo by itself might not be strong but you group a lot of images together and tell a story. Ike I’ve been telling you guys today, telling you what’s been happening. Man it makes more powerful set of images. That’s it. Brent: Amazing, I love it man. 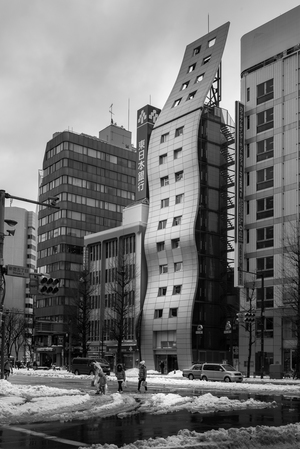 Thanks buddy for inspiring us with those monochrome images from Tokyo. Love it. Johny: Alright guys, we’re into the Create. Brent: Okay what do you want to teach us today Johny? Johny: Yeah man so I’m in Lightroom, I want to do something a bit of post processing and it’s down the vein of having multiple images you want to make look the same okay. Johny: Yeah man pick and reject. So if you don’t know about pick and reject technique, we might drop in my JSP show where I show you how to do that. We’ll put that in the show notes. Johny: Choosing your images or choosing your keepers. Brent: Yeah keepers. I love that word. Johny: Yeah, your winners man, so easy man, 2 keys and bomb. You’re done. Brent: What’s a P & X? Johny: X and P. X for reject and P for pick, have order advanced term, that’s a tip; 2 fingers “tsk tsk tsk”. Brent: Yeah, there we go. Brent: Same situation, photography situation. Johny: Similar situation okay. I mean you can go through and adjust the exposure and that light or something and that’s not a huge deal but I would take the first image and what I would do is I would do things like balance the histogram in the first image. I would set the white balance you know in the first image. I would fix up the highlights and shadows and balance the histogram. I would go down. I would also fix up any noise, you know so it’s a good groove if it’s shuttered at the same time and lock them in the same also. A little bit of noise there, I’ll fix that up. I’ll do my first sharpening in detail, add my vignette and I would also do lens correction here. So that’s the far as I go. I wouldn’t do any cropping. I wouldn’t do any local adjustment. Why did I say local adjustment? I mean radio filter or the brush tool. And then also I need to do is select the first image, and the last image okay. And then I would hit the sync button. Johny: Okay, but this is a point where you don’t want to sync everything. So the things you don’t want to sync and if you’ve actually done any local adjust in there. You can turn things off you don’t want to sync the rest of the images. This is the important thing here okay. So things I would not sync okay. Brent: So you’ve checked all over there. Johny: Yeah, so basically I’ve done my first part of this image. Johny: You know it may need a crop. It may still needs some local adjustments. It may need relighting okay. There are things I probably would sync across multiple images. Black and white version in Lightroom if you want to do that, sure sync that, not a problem okay. So the things I wouldn’t want to sync okay is cropping, spot removal okay. Lens correction definitely I would want to sync. Black and white I want to sync that’s fine. And any local adjustments like that. They are the sync I wouldn’t want to sync. And then I just needed to hit the synchronize button. And what Lightroom is going to do? It’s going to go through in all those basic changes that you’ve first done. It’s going to upload those to order images. Okay, so basically all of your images are at some sort of a starting point. So you don’t have to go through it like lens correction and all those things for every image. And then after that what you would need to do after I’ve sync those images and they all look very similar then I’d go back and check the exposure. So first thing I’ll do is go to this first image, check the exposure, it doesn’t need relighting. I would do those things and then I would do my crop. And then that’s all I need to do for every image. Just go through the next image, check the exposure, and relight the scene if I need to with the radio filter. And then that’s it. It’s done; next image; so you’ve saved yourself for about 60 or 70% of the work and you’re fine. Some of the images are very similar. You’re finished. Johny: That’s it. You’re done. That’s all you have to do. So anyway guys, it’s just a quick tip of editing multiple images of very similar together. Johny: Save yourself a time. Brent: Saves a heap of time. Johny: Saves a heap of time man, the sync button. Brent: And that’s what I love about Lightroom. I’ve been doing that since the beginning of Lightrooom. That’s what I loved about it. Johny: Yeah, it’s so good man. It’s so fast and I highly recommend it. Now, say you had a set of images, say you’re a wedding photographer okay. And you had a set of images that are taken at the reception. Then you had a set of images that were all taken outdoors. What I would do is group those images together because the indoor one more and likely all those basic settings are going to be all the same. You know so you sync those groups. Brent: Same white balance, yeah. Johny: You may have a shoot with a thousand images and paired them down to 500. But 200 hundred of those were shot inside so they are the ones you sync together. So that’s the way you’ve got to keep in mind. So even though you’ve shot different locations during the day, you want to group everything that’s similar and sync all those. And that’s going to save you heaps of time. Johny: Lighting mostly, it’s all about lighting. Brent: Photography is all about lighting. Johny: Really? I don’t know. Johny: There we go. Photography is about light. Brent: I think Johny has led us something today. Johny: Yeah, that’s it man. Cool man, so that’s it guys. I hope that speeds up your workflow and don’t forget if you’ve got group of images, don’t just count; put them together and tell a story man coz I think it’s an epic way man. Johny: And also, don’t forget about my free post processing course. Johny: I am super pumped man. You’ve got to jump in and get it done. Johny: Yeah this is also something Brent and I really believed in. We believed that the information should be delivered over time to give you a time to consume it coz what happens man like I don’t know so many people and I know this from my Lightroom course buddy. You know this 40 something or 43 videos in there. Johny: Some of the good stuff is near the end and people don’t get to it coz it’s just so much to consume. So we’re breaking it down. We’ll give it to you in chunks and easy to consume and man I love that format. I think it’s going to be win bro. Brent: it is. Definitely so grab it guys. And thanks Johny for sharing and inspiring us with images from Japan and telling the story of your trip and then also how to sync it all up in Lightroom and save time. Johny: That’s it man. Awesome bro, so it’s been another epic show man. I’ve enjoyed it. And hope you guys have to. And as always if you’re feeling the love man; give us all 5 stars in iTunes. We’d love that and as always we love your feedback and you can hit me up on Twitter. It’s ijohny. I’m loving the tweeting man because it just keeps my inbox free. Brent: Yeah definitely. And if you want to talk to me just jump into the Share Inspire Create Lounge. We’re there with Johny and other great photographers and sharing the photo love. Johny: Yeah man, loving the lounge. Brent: See you guys next week, bye. Johny: Have a great week, bye.